Give your kids a seat beside their favorite mouse with the Disney Minnie Mouse High Back Chair from Marshmallow! Designed for children aged 18 months and older, the High Back Chair offers a comfortable place to play with toys, watch TV shows or read books. Its high-density foam construction makes it lightweight, stable and cozy. Toddlers are sure to gain a sense of independence and ownership as they move their seat around as they like. For added parental convenience, the slipcover is designed with a safety zipper to protect your little one. To unlock, insert a paperclip into the opening, pull upwards and slide to unzip. Made to withstand toddler wear and tear, the High Back Chair is also machine washable with mild soap and water. 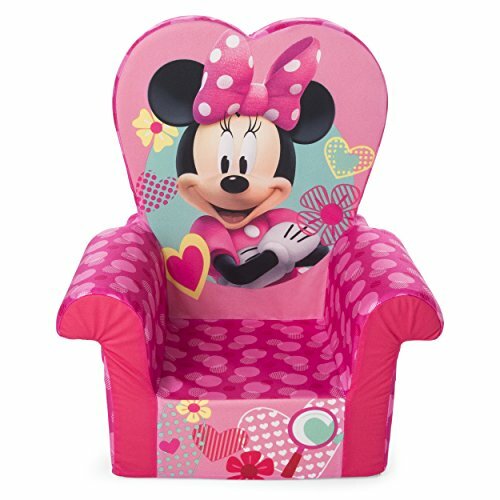 Give your little one a fun and comfy place to call their own with Disney’s Minnie Mouse Foam High Back Chair. Now toddlers can take a seat in the 'Just My Size' Disney Minnie Mouse themed High Back Chair! Made from soft and durable lightweight foam, High Back Chairs make the comfiest of seats or rest areas and are easy for your toddler to pick up and move. Marshmallow High Back Chairs are for Toddlers 18+ months. Size: 20.8"H X 14.5"W X 12.8"D. Made from 100% Polyester and 100% P U foam..